To everyone waiting anxiously for the results of the 2017 CWMN season - the wait is (sort of) over! We’ve been working on updating our database these past few months so that we can get water quality information to you. Thank you all for your patience. While it’s not totally up to snuff, we are ready to share the E. coli results with you. E. coli levels are not the only parameter we test for, but they are a very useful one. 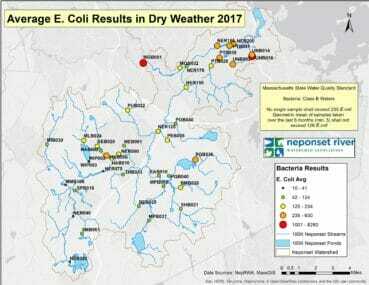 E. coli bacteria are found in streams naturally, but elevated levels point to problems like excessive stormwater runoff, illicit sewer connection, and dumping. This bacteria is important to monitor closely because too much of it makes a river unsafe for recreational activities. Volunteer Peter Byerly on the Neponset River in Mattapan. 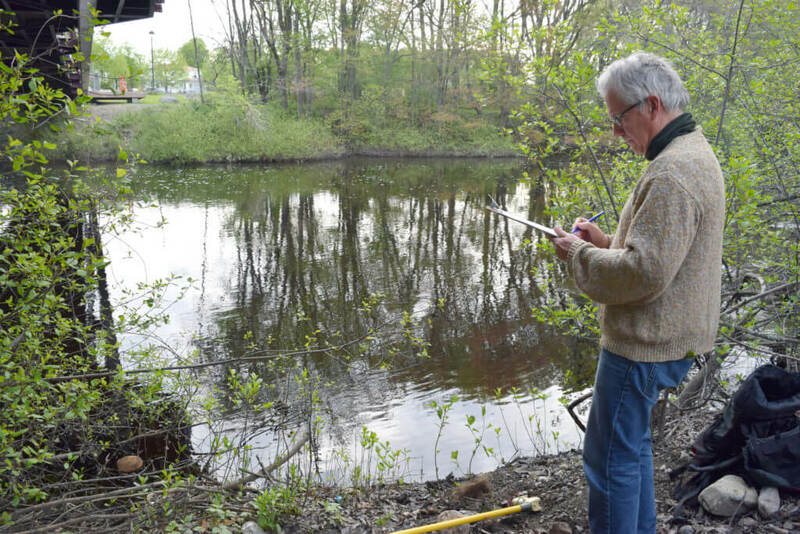 Our water quality monitoring program runs from May – October every year, rain or shine. Our team of volunteers sample 41 sites throughout the watershed on every third Thursday of the month. We classify “wet weather” sampling as days when there have been more than 0.1 inches of rain accumulation over the past 3 consecutive days. This year, our June, July, and October sampling events fit this description. May, August, and September were dry weather sampling events. Below are two maps that demonstrate the difference in water quality observed throughout the watershed during dry and wet weather sampling events. Average E. Coli results for May, August, and September 2017. Average E. Coli results for June, July, and October 2017. 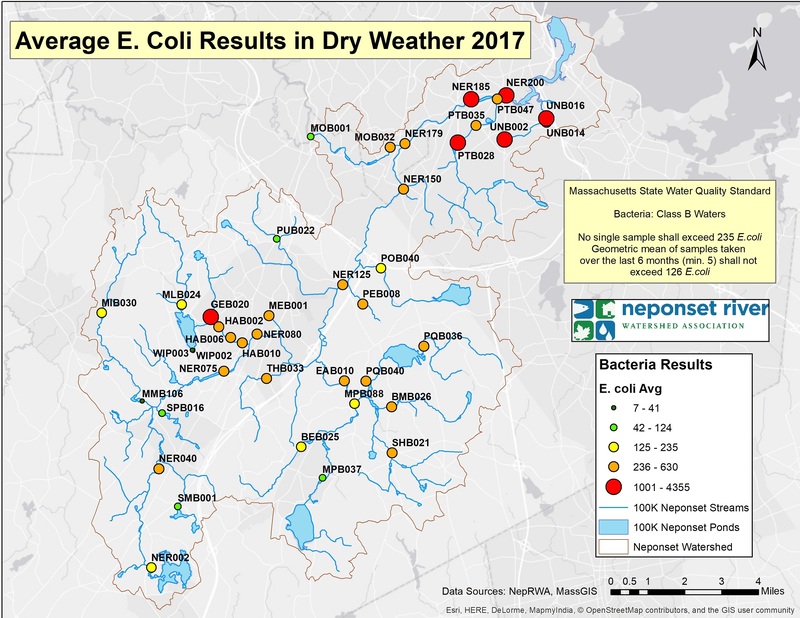 Massachusetts State water quality standards for bacteria state that E.coli concentrations should never exceed 235 cfu (colony-forming units) to be considered safe for swimming. To be considered safe for boating, the limit is 630 cfu. On the maps above, sampling sites that are yellow or green are “swimmable,” and sites that are orange are “boatable” but not swimmable. Sampling sites that are red are not safe for either activity. Levels of bacteria in a water body are expected to be higher in wet weather due to stormwater runoff. During precipitation events, rainwater runs over impervious surfaces before reaching stormwater drains and flowing into the river. As it flows over the pavement, the rainwater picks up contaminants, trash, and even pet waste (which contains a lot of E. coli). This explains why there are 6 sites that are unsafe for swimming and boating during the wet weather sampling compared to the two sites unsafe during dry weather. Water pollution from stormwater runoff is something that all urban watersheds struggle with. You can learn more about how you can help to prevent stormwater pollution here. During dry weather, high levels of bacteria in the water are more concerning. Often, this points to problems such as illicit sewer connections or sewer leaks. The two spots that exceed both the swimmable and boatable standards even in dry weather this sampling season are sites on Unquity Brook in Milton and on Mother Brook in Dedham. Unquity Brook has long been a problem area for the Neponset River, and it continues to suffer from high levels of bacteria. This specific sampling site frequently has very low flow which concentrates any pollutants that may be present, and there are known illicit sewer connections in the area that have yet to be resolved. Both of these factors can contribute to high E. Coli levels even in dry weather. In the case of Mother Brook, we went to investigate and found that there was an outfall that was discharging a cloudy grey (and pretty putrid smelling) liquid. It was clear that the source of the liquid was runoff from the parking lot of the transfer station directly next to it. The town of Dedham is now aware of this problem, and they are working with the transfer station to hopefully resolve this issue. More information on these hotspots and others can be found here. As always, a huge thank you to the volunteers that make this possible! We are still modifying our database to best suit our data analysis needs, but we are hoping to be able to publish more results soon. Keep an eye out for more water quality updates in the near future. If you have any questions or want to get involved in the water quality monitoring program, please contact our Environmental Science Fellow, Annie O’Connell, o’connell@neponset.org or 781-575-0354 x306.